"So many of the problems are caused by gang members, many of whom are not even legally in our country,” Trump told a group of police chiefs Wednesday in Washington. President Donald Trump has called out Chicago’s surging violence for the second day in a row, faulting gang members who are “not even legally in our country" for much of the city's crime. Trump urged a group of cops Wednesday at the Major Cities Police Chiefs Association Conference in Washington to “turn in the bad ones” to Homeland Security Secretary John Kelly, referring to undocumented gang members. Trump failed to provide evidence Wednesday to support his claim that undocumented immigrants are behind much of the gang violence in major U.S. cities. Nevertheless, the Republican once again extolled the virtues of a Mexican border wall, claiming his proposal will “stop the drugs from pouring into our country." Trump's comments mark the second time in as many days the president has publicly bemoaned the city’s crime rate. “In Chicago, more than 4,000 people were shot last year alone,” Trump said. “And the rate so far this year has been even higher." “What is going on in Chicago?” he added. According to data made available by the Chicago Police Department, the city saw 3,550 shooting incidents in 2016. Shootings are up by roughly 8 percent so far in 2017 compared to the same time period in 2016, according to the Chicago Tribune. The publication notes, however, that homicides are down by about 20 percent. During his speech Wednesday, the president blamed gangs for crippling areas with “violence and fear." Mayor Rahm Emanuel’s office continued to push for a federal partnership Wednesday, criticizing Trump for failing to act. “With all the talk and no action, you have to wonder whether the administration is serious about working with us on solutions, or if they are just using violence in this great city to score political points,” Emanuel spokesman Matt McGrath said in a statement. “We’ve been clear, there are ways the federal government can help, and we’re happy to partner with the new administration whenever they decide to stop talking and start acting,” McGrath added. 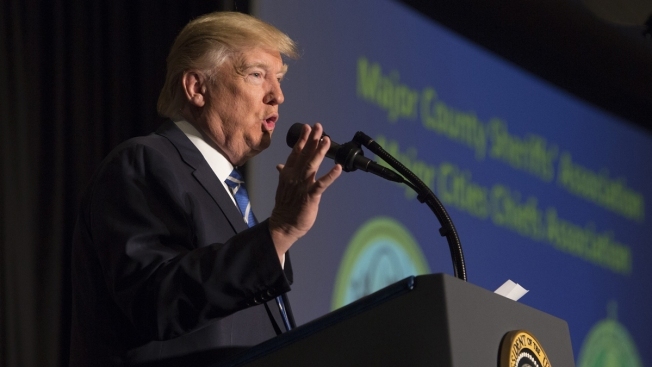 Trump also highlighted the city's violence during a meeting at the White House Tuesday with county sheriffs from across the country. “It’s so sad. Chicago’s become so sad,” he added. Chicago Police Supt. Eddie Johnson echoed the mayor’s call for increased aid Tuesday, pushing for more federal agents and resources. So far this year, Chicago has seen 61 homicides and 368 shooting victims, according to the Tribune.